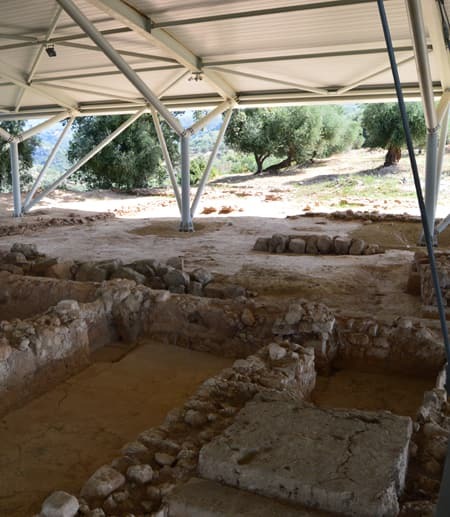 Olivia Angsten ’18 spent a month this summer confirming how much archaeology means to her during a dig at Iklaina, a historical city near Pylos, Greece. Angsten, an archaeology major who’s minoring in English, spent her days working at a dig site, then took part in lectures before dinner and adventures out and about. The tour was coordinated by the University of Missouri-St. Louis, and staff and volunteers who taught students about basic field information and general Mycenaean history and archaeology, but also lectured on Greek art, marine archaeology, preservation of ceramics and even geoarchaeology, Angsten said. “I got to learn a lot about the different branches of archaeology, and how they are all needed to create as complete of a picture as we can with our limited resources,” she said. The 25 students on the trip came from across the U.S. and Thailand, she said. Angsten’s grandfather’s family came from Greece, so she said her relatives followed her trip closely through her Facebook posts. “Any picture that I was tagged in was inevitably commented on by at least five of my family members,” she said. Angsten said she would go back in a heartbeat.